Infrared Technologies provides you with experienced and certified thermographers. We have an excellent track record servicing our existing customers, providing infrared electrical inspections, as well as home energy audits. Ultrasonic compressed air leak inspections- detection, tagging and recording air leaks throughout a facility and estimating air loss and the cost associated with the air loss. Ultrasonic underground water leak detection — pinpointing water leaks under slabs, concrete, asphalt or dirt. Infrared home energy audits– total evaluation of homes for energy efficiency utilizing state of the art infrared cameras and blower door. Our technicians are fully licensed and insured, certified thermographers with an excellent track record with our existing customers. Our team will identify any problem areas and recommend an effective solution. Contact Infrared Technologies to learn more or call us at (317) 489-7199. Industrial, commercial, warehouses, office buildings, hospitals, or any facility that utilizes a significant amount of power. Many insurance providers either request or require their customers get this procedure done. 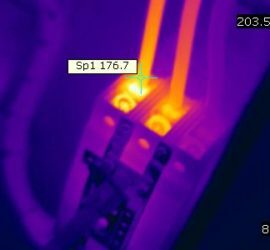 Infrared electrical inspection is a major part of predictive maintenance. Very much so. Safety is a priority when opening live panels.